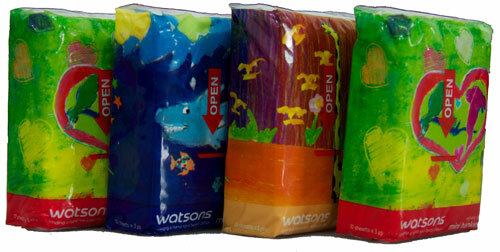 The next time you need some tissue paper, why not get it from Watsons? Singapore’s number one favorite health and beauty retailer is proud to introduce Helping Hands, an initiative to raise funds for their official charity of the year, the Chen Su Lan Methodist Children’s Home. 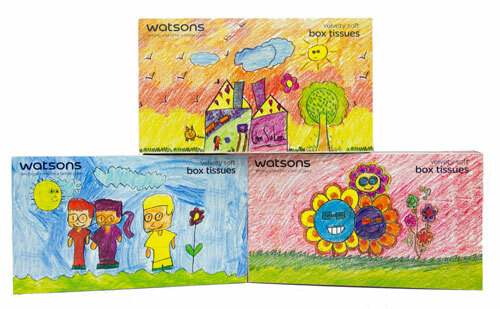 Watsons will be producing limited edition box tissues, mini hankies and travel packs which feature colourful illustrations done by children from the home, with the aim to pledge $20,000. 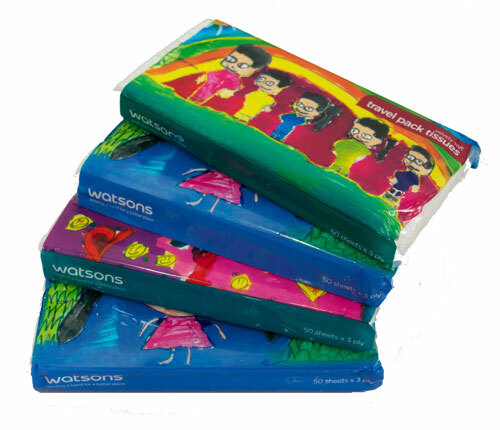 These limited edition tissue sets will be available at all Watsons stores from November 2013 to February 2014. Launched for the first time, Helping Hands hopes to empower and fulfill the wishes of the children in Chen Su Lan Methodist Children’s Home. Based on the theme “I Believe in Magic”, the drawings featured on the tissue sets provide the children with an opportunity to express themselves through art, whilst reflecting their desires for the future. Nine different artworks will be featured, and for each box or packet of tissue purchased, Watsons will donate ten percent of the proceeds to the Home. “By featuring the children’s artworks on items of necessity, in this case tissue paper, we can help share the hopes and dreams of the children from Chen Su Lan Methodist Children’s Home with everyone; we believe that presenting these drawings to the public can also help build the children’s self-esteem and pride in their works, and help them see the magic in their creations too,” he added. An approved Voluntary Welfare Organization registered under the Charities Act and member of the National Council of Social Services (NCSS), Chen Su Lan Methodist Children’s Home cares for the well-being of needy and disadvantaged children, providing them with an inclusive home environment and helping to strengthen their family relationships. The series kicks off with colourful artworks depicting a happy Chen Su Lan Methodist Children’s Home, three brave musketeers and cheerful sunflowers, printed on box tissues. Each box tissue pack (3plysx100sheetsx5boxes) will retail at $4.50. The drawings will also be featured on mini hankies. Designs include a bright and sprightly giraffe, a friendly shark and two lovebirds. These creatures of the land, sea and air will be available on packets of mini hankies (3plysx10sheetsx16packs) retailing at $2. 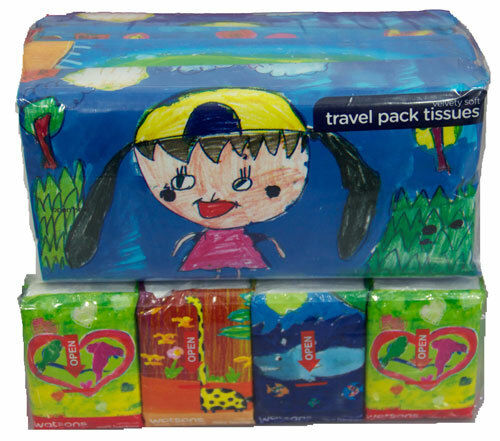 Customers can also bring these lovely pictures with them as they explore the world with the tissue travel packs (3plysx50sheetsx4packs), retailing at $2 each. Delightful illustrations of hearts, a happy girl and a vivid rainbow make welcoming safe wishes for travels abroad. These illustrations were specially designed for the Helping Hands project, drawn during art classes that were organized by Watsons for the children. Beyond raising funds, Watsons will be going a step further to bring a little more magic to these children, inviting them for an exclusive movie screening and tea party at the end of October 2013. Corporate social responsibility is a key aspect in Watsons’ corporate strategy. Over the years, the leading health and beauty retailer has adopted various initiatives to give back to the community. Breast Cancer Foundation (BCF): Watsons was the title sponsor for the annual ‘Watsons Pink Ribbon Walk’ in 2010 and 2011. To raise funds for BCF, Watsons undertook several breast cancer awareness initiatives including the Watsons’ Pink Shelves Program, selling of BCF pink ribbon pins and placement of donation boxes in selected Watsons stores. 2010 saw the brand raise a total of $80,000 and 2011 saw Watsons raising a total amount of $100,000 for the Foundation. AG Home: Last year, Watsons adopted AG home, a shelter for troubled teenagers, as their official charity. The beauty and health retailer raised funds for the Home via donation boxes that were placed across Watsons stores. In addition, the brand also employed some of the female residents as Christmas helpers to wrap presents during the festive period, providing them with retail experience in the beauty and health industry. The girls also helped retail the Watsons Christmas Catalogue and proceeds went back to the Home to fund programs such as skills, sports and education. So, join in this meaningful cause and help bring a little bit of magic back to the children of Chen Su Lan Methodist Children’s Home.